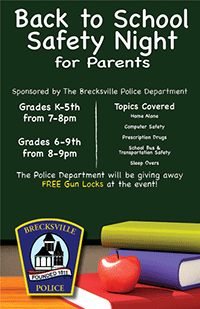 The Brecksville Police Department believes it is important to interact and communicate with the community about issues that impact the health, safety and security of the community. The department schedules presentations through out the year, but is also available to do presentations by request. Presentation topics include but are not limited to: personal safety, school safety, home safety, driving safety, fraud awareness and gun safety.